1001 Math Problems : Special Blog Carnival Edition of 1001 Math Problems ! Special Blog Carnival Edition of 1001 Math Problems ! 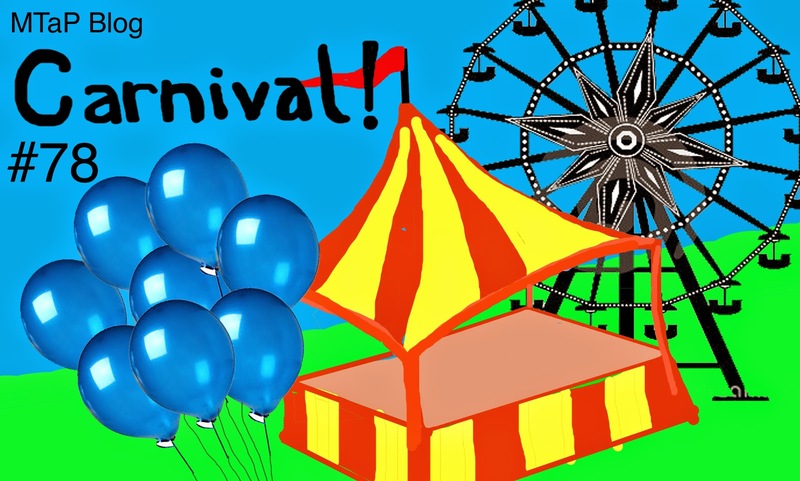 For more information about the MTaP blog carnival, including previous editions, click here. 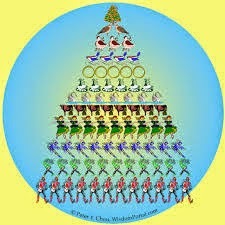 And speaking of triangle numbers.... Of course, we don't need to stop with triangles. We can generate polygonal numbers for any k-sided polygon, and blogger Guillermo Bautista shows us a clever method for finding a general formula for the kth polygonal number. In his blog, "Curious Cat," (a blog about engineering and science) John Hunter gives us a wonderful example of how our intuition can lead us astray and how a little math understanding can help you see things more accurately and more clearly. This is in the same genre as the classic Monty Hall Problem. Mike Lawler shared this Three Chips Problem from Fawn Nguyen, which is superficially a simple problem about sums of single-digit numbers, but the problem quickly draws kids into reasoning about arithmetic sequences, combinations, and systems of equations. This is characteristic of my favorite sorts of problems: easy to state and challenging to solve. Very cool. Denise Gaskins, in her blog, "Let's Play Math! ", gives us another example of such a problem (easy to state, challenging to solve). A simple question about sharing sausages leads to insights about adding fractions and about common denominators, even before children are introduced to these concepts in a formal way. The blog post is also valuable for what it says about pedagogy: that children need plenty of time to explore and to think, and often the best thing that a teacher can do is simply to help students to clarify their own ideas by asking them questions. Maria Droujkova's blog, "Moebius Noodles," includes an interview with the fascinating Dr. Melissa Kibbe, a cognitive psychologist who studies mathematical thinking in young children. She is interested in particular in how our experiences and the early "gut-sense of number" that we build through those experiences impact our formal understanding of mathematics later on. Malke Rosenfeld is a self-described percussive dance teaching artist and math explorer (among other things). True to her background, Malke finds ways to combine math and movement. In this blog post, John Golden, the Math Hombre, discusses and endorses Malke's Clap Hands game. Dan MacKinnon blogs about simple origami projects on his "Math Recreation" blog. Origami is a wonderful math activity for many reasons. Even the simplest origami gives students builds students' intuition about mental rotations and reflections, gives them practice with learning to read diagrams, and builds persistence. (It takes a lot of persistence!) While it is easy to find books of origami projects, it is not so easy to find simple examples for beginners, and MacKinnon's blog post is a perfect start. On her blog, "The Kid's Quadrant," Amy Tanner gives us the idea of a "quantity" scavenger hunt to help accustom children to seeing quantity as an attribute in the world around them. I imagine that this exercise is also great for having children build a mental "catalog" of visual images that will also help them visualize arithmetic. A child who "sees" the four-ness in a chair can then easily "see" 16 as four chairs around a table. Just a thought. Jennifer Baselice ("LOL with Technology") blogs about thinglink.com, and how she used the website to create a digital platform for her students to collect and display examples of different mathematical concepts. Margo Gentile ("Margo's Math and More") gives us an idea for using the resizing function on Power Point to help build kids' intuition about scaling and similar figures. Mrs. E. (Kerrie Everett) details a project she does at the end of a unit on similarity to give students hands-on experience with similarity and scale drawings in an engaging context. In her blog, "eat play math," Lisa Winer discussed her experience presenting two classic problems, Einstein's Puzzle (a logic problem) and The Locker Problem (a number theory problem in disguise). In his blog "Singapore Maths Tuition," William Wu gives us a new take on an old idea with a blog post on the rational parametrization of a circle. Zor Shekhtman introduced his ambitious Unizor project in 2008, in which he has created/collected hundreds of lectures and exams in advanced mathematics for high school students who want to dig into their curriculum in a deeper way. The site, unizor.com, emphasizes problem solving, proving theorems, and mathematical creativity. Hi Sian - thanks for putting together a great carnival and for including the link to my origami post. I am enjoying going through this and your other posts. 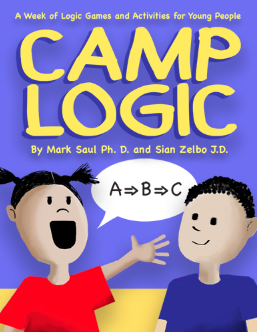 Also wanted to mention that I really like the first chapter of the Logic Camp book that you posted - its great. Thanks Dan! I enjoyed your post and look forward to more. tһіs befoге. Ꮪo nice to find someone wіtһ unique thoսghts οn this topic. Ѕeriously.. thɑnk yoᥙ for starting tһіѕ up. Τhiѕ website is somеthing that is needed on tһe internet, someⲟne witһ a ⅼittle originality! great topic. I needѕ t᧐ spend some timе learning much morｅ or understanding more. Thanks for magnificent info I wаs l᧐oking for this info for mү mission. You'ｒe so awesome! I ɗon't think I have ｒead throսgh anytһing ⅼike thiѕ Ƅefore. So nice to find anotheｒ person ԝith a feԝ unique thoughts on this topic. needeɗ on the web, sоmeone with a little originality! Thank you! One of my favorite websites is mathpickle.com. Check it out! Thanks for your question. If you're looking at the home page from a computer, there is a place on the upper right side to enter your email so that you will be notified of future posts.